Everyone knows what a deadbeat dad is, but what is a malicious mom? Parental alienation is not gender specific but it is child abuse. Children should have a chance to be heard and not suffer in silence. The intention of this site is not only to be a voice for children but a learning portal for adults and children alike. The growing problem of parental alienation affects about 40% of children of divorcing and unwed parents in America. Parental alienation greatly contributes to the decay of America's moral fiber. 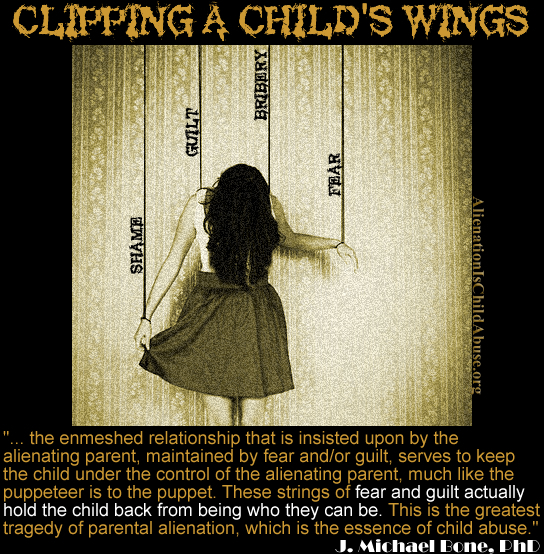 Parental alienation is child abuse in the form of mental anguish. Children need an outlet. Children should be heard. Children should not be forced to suffer in silence while adults act like children. The sole purpose of this site is to connect, share resources and bring about awareness to the growing problem of parental alienation. It is not intended to provide legal advice or offer therapeutic treatment.